This post has its roots in some conversations I’ve had with friends who are involved in education and enrichment, and in our mutual realisation that, although we may have different words for it and although we may face it differently, there is an experience we all recognize, and which it is very hard to coach students through. No matter what you are doing, there is always a point early in a project where you find yourself staring at a blank sheet, wondering where to begin, what to do, and how to approach the challenge. This happens in every field of endeavour, whether it is obviously “creative” in the sense of painting, embroidery, or sculpture, or in a more academic field such as mathematics (The Australian is a mathematician, so I know about these things, even though I’m not one myself). And it isn’t limited to beginners. You stare at your blank sheet, mind racing – or frozen – completely overwhelmed. Everyone devises their own strategies to overcome this, and the sooner you find your own, the easier your life will be. There was a lot of this! The first is to pick something – anything – and try it. I am coming to realise that one of the signs of not being a beginner any more is the willingness to do work which may be abandoned – unpicked, reverse stitched, torn up as leading down a blind alley. Sometimes you have to see What is wrong, and How it is wrong before you can pick the Right Thing. Another very useful strategy is to create limitations – to lay down rules that limit your choices. The idea is that part of the reason you’re overwhelmed is that with so much you could do, it’s almost impossible to choose which. In mathematical or computing terms, what you need to do is restrict the search space. It might seem paradoxical, but when you restrict your choices it can become very much easier to make progress. So the strategy of making a set of rules, or creating a framework within which to make decisions (to write a sonnet, say, instead of blank verse), can help you get started. Once you’ve got started, you can then decide to break the rules if the effect will be better. The important point is that you’re now over the Fear of Blanks and into the flow of the project. When I’m working on a new project, I have to make decisions about the design, the fabric, the colours, the threads, and the stitches. Some of those decisions may be made for me. 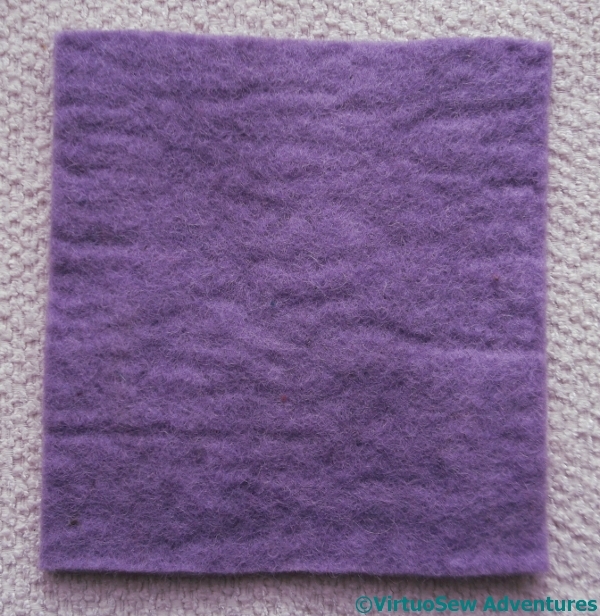 For example, if the project is “domestic” – a table runner, a cushion, the cover for Maggie the Magnifier – then I know where it’s going, and the colours will have to work in the room in question. Or if I’m embroidering a garment I already have, I have no choice about the fabric, and very little choice about the threads. I don’t have to worry about those, and can spend my energy on design and stitch choice. But in the case of The View of the Excavation, for example, I had the design, but I then spent days – weeks! 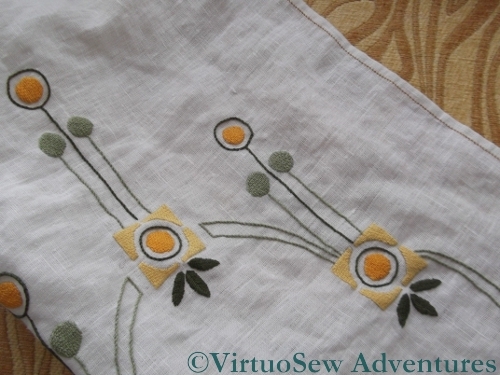 – staring at it and wondering what stitches and colours to use where. 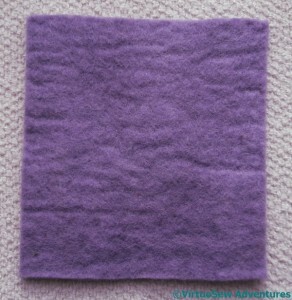 3 – Ground features in the same colour and stitch wherever they are. I still had freedom to choose stitches, threads, and colours, but The Rules restricted the range within which I was choosing, and so made the decisions easier. 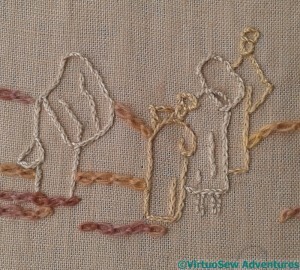 Furthermore, because I’d picked a stitch and thread for ground features, I could get started, and think while I stitched, which meant that as I came to apply my various rules, the blank fabric was already no longer completely blank. 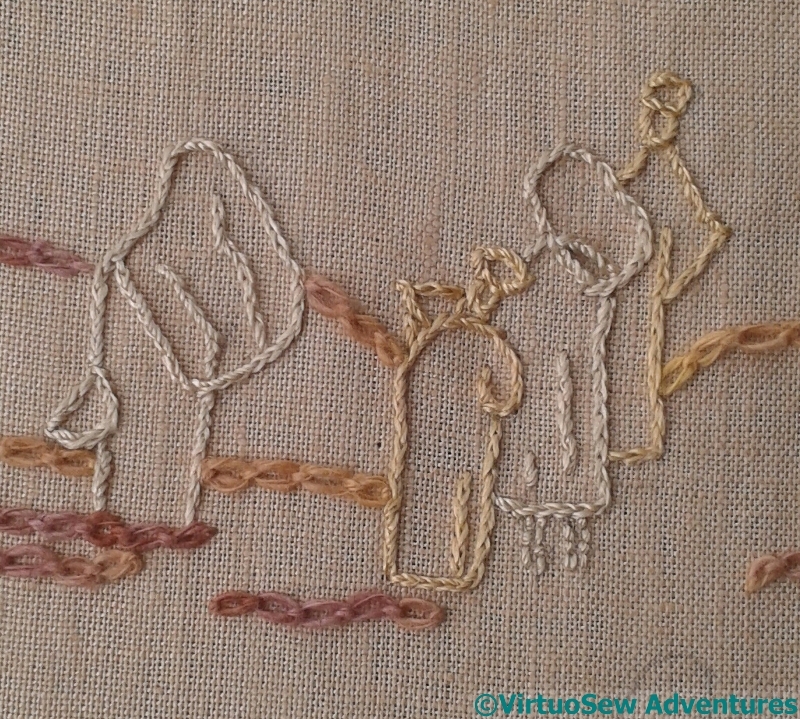 Each of the first two rules could be elaborated further, so for Rule One, I picked two different pale colours to choose between, and chose one stitch to use. Again, the decisions are thereby reduced and thus easier to make, which means that progress can be made while thinking about the next stage. 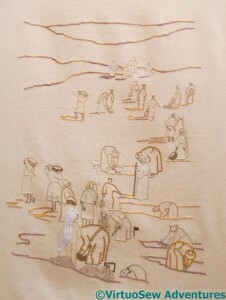 This is the manifestation in embroidery of one of the reasons that school maths can be dull and repetitive – it is trying to inculcate skills which will allow us to work mechanically on the simple stages or processes of a problem or puzzle, leaving the brain free to tackle to the more complex parts that will require serious, creative, and inventive thought. My sitting quietly working the “easy” bit while I think about my next step is exactly analogous to the mathematician rattling through some calculations while they consider what part of the problem to tackle next, or the writer writing a descriptive section while the back of their mind is busy mulling over the plot. So next time you’re stuck over something, try this: pull some rules out of thin air and stick to them. Then break them. Thoroughly. And with enthusiasm! Oh yes – I so recognize that staring at a blank page moment: it’s both scary yet exciting. Next time I am stuck ……… I shall ask you what to do!! I wouldn’t say I have ever needed to overcome a fear (when it comes to sewing or needlework) but I have been faced with many ‘blanks’. Your approach of creating rules and eliminating the choice are great ways to tackle the problem of being stuck. Too many projects turn into UFOs because we don’t make that extra effort of going ahead. 🙂 Love that last paragraph! Practical advice that should help get something on that blank space and still allow improvisation. I love how you’ve worked mathematics into this post 😊 I shall show hubby, he will be impressed. I’ve only really started designing my own pieces in the last couple of years, but I know what you mean about the fear of starting. Or maybe it’s moe apprehension that it won’t turn out as envisioned in my mind? Either way, I find just starting somewhere, knowing I could very well change my mind and need to start again, is the best way to get over it! A lot of sage advice there, Rachel. Self imposed restrictions are great for the design process – you can always break them later when the design starts to tell you what it needs. I tend to avoid the blank piece of paper syndrome by doing the preliminary work on scrap paper, and I test stitches on scruffy oddments of fabric. So when I am ready for the blank sheet, I am looking forward to it and have at least the fist stages in my head, ready to roll. This does not mean that things never need unpicking! Confidence in being able to put things right, and the Zen of taking out a week’s hard work do come with time and experience. Another plus is that we can now visualise the results of our designs more accurately, so there are fewer major disasters. On the other hand, we can be tempted to stick to the things that we know will work and are in our comfort zone: running on the same old rails, rather than flying into a project with the innocent enthusiasm of the raw beginner – who comes up with fresh, inspiring stuff as often as she gets bogged down by mistakes. Why didn’t I think of that? Is that also the same in mathematics, I wonder? Wasn’t this just what I needed to read today – you’re so right I think, limiting choices. I’m always willing to abandon something if it’s done all that it needed to do for me, and I do the part know first whilst letting my mind mull over the hard part in an absent-minded way but I haven’t got there yet with limiting choices. Oddly enough I wrote a post today along these lines and the solution for my current dilemma was to make more samples to experiment on! I understand exactly where you are coming from, although I had forgotten that I had a set of rules that I work to. In fact rules for different genres and they make all the difference to the process of how you work. I think I need to sit and get them down on paper to remind myself. your description of the ‘fear of the blank page’ is perfect and your suggestions at overcoming the fear are spot on. Great post Rachel. I’ve never put it into words quite this way before, but I think that’s what I do with my CQ. 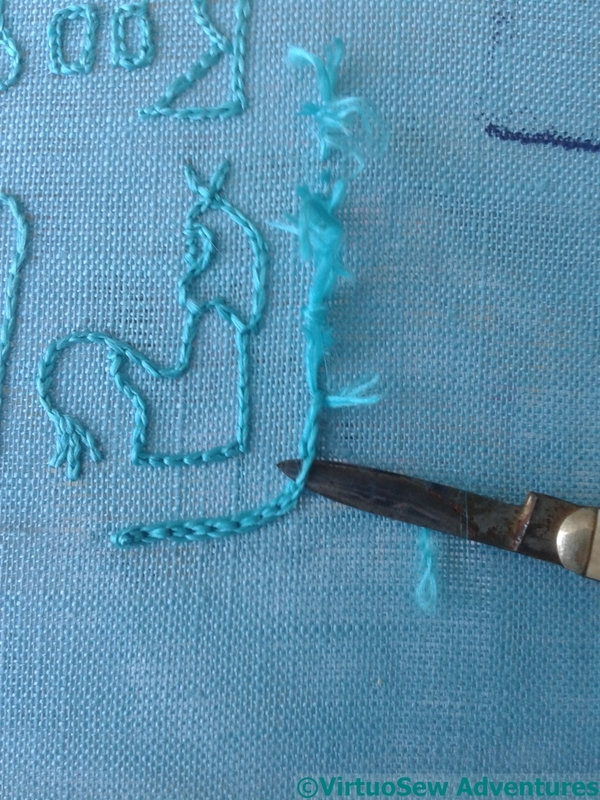 Some people design an entire block and then stitch it exactly as they designed it. I can’t function like that. I have to put on seam on and then think about what would go with it, or how I want things to progress. So interesting to see it compared to math, because I don’t earn my money with math, I’ve loved math always and find it easy to think in math, and easy to teach it at the elementary level where I worked. Having you sort it into mathematical terms, made it so easy to understand what your design process is. 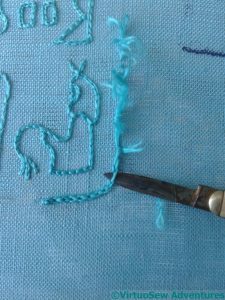 such an interesting and lovely post.Till now I’ve never put both math and embroidery in a same sentence. Fear of starting a design is something I’m trying to overcome.